There have been documented more and more testimonies regarding its existence, in the United States, UK and the Russian Federation, being named “Butterfly Man”, “Batman” or “Mothman”. But what these creatures are? Aliens, unwanted guest from parallel worlds or the monstrous result of genetic experiments? At the end of Russia, near the border with China, surrounded by the unexplored taiga, there is a wild region, ruled by beasts, by the Amur tiger and the Asian bear, a region where man shyly came, barely less than a century ago. In recent years, locals of this untamed area have repeatedly reported the existence of a frightening winged being. According to testimonies, here, at night, eerie screams can be heard and animals disappear from people’s yards: sheep, rams and even calves. Their remains are later found in the woods, a few kilometers away, on the top branches of the trees. But might there be such a being able to pick up in the air a strong and hard animal as is the calf? What kind of monster inhabits taiga Primorsky Krai? Residents of the region tell that this creature lives in the caves of Pidan mountains and they’re convinced that is half man – half butterfly: the winged man. In the winter of 2010, in eastern Siberia, on the way from Vladivostok to Khabarovsk, drivers had an amazing spectacle: on the road, there was a Siberian Tiger; moving confused and frightened among cars and trucks. Such an occurrence is completely abnormal, knowing the fact that this predator is never getting close to the human community. Something caused him to leave the woods. Most likely a more powerful being, a frightening beast banished him from the wild. People living nearby are convinced that it’s the same winged creature who is disturbing their peace and tranquility for years. “The rain had completely stopped, the air temperature suddenly descended and a thick fog was rising above the waters. Suddenly, on the path, I saw a trail that seemed human. On the left, I heard a noise of broken branches. Alpa has become disheveled and began to growl menacingly, yet not daring to unpeel of my feet. Although we couldn’t see anything from the thickets, I was convinced that the animal hadn’t fled, but had stopped by, watching my moves. We stood there, petrified, for a few minutes. My patience was over and I turned around, with the intention of leaving the area. The Russian explorer, first European who dared to cross this wild land that once belonged to the Chinese Empire, was accompanied in his journey by some udegi natives, population that is living on this territory for several hundreds of years. In the evening, after dinner, the researcher told udegi hunters about the stunning occurrence of the taiga. They didn’t seemed surprised at all. From their ancestors, they knew that in these places lives a man who can fly through the air. The being was described by several witnesses who claimed to have more than two meters tall and is surrounded by an aura that radiates a bright light. It has a human face, big, round and bright eyes, human body, only that instead of arms has huge wings, ending in claws. Many hunters have often encountered in the taiga traces of the enigmatic being. Traces of its steps appeared on earth and then suddenly disappeared, which led them to conclude that the creature “was landing” on the ground, took a few steps and then flew away. The udegi said they even tried to hunt it, spying it in the thickets of the forest, but each time the creature had been banishing them, screaming just like a human. Screams were just like Vladimir Arseniev had heard that day. A member of his expedition, the Chinese Dzan-Bao, said that similar evidence existed in China, where the winged creature is called “li-dzen-zi” (man with wings). Reportedly, it lives in the mountains, far from human settlements. In 1944, near Ekaterinovka town, in the south of the same region, Primorye, a detachment of Soviet soldiers had established its military base. One afternoon, few of them, who had been in the village, for supplies, were returning to the unit. They weren’t even walked 3 kilometers, when they saw something from the sky pouncing upon them. Terrified, the soldiers noticed it was a huge winged creature with human face. The beast drove some “female” sounds, as it had been mourning. They threw their food baskets and broke into a run to the village, where they have told locals about flying man’s appearance. Following these testimonies, from Vladivostok arrived a commission that investigated the case. Soldiers were interrogated for days. Later, for unknown reasons, they were sent under supervision to a secret location and their track was lost. That event determined Vyacheslav Dvujilnîi, researcher of paranormal phenomena, to reach the assumption that the army might be behind the “flying man case”. Professor Dvujilnîi, who is studying the winged creature phenomenon for over ten years has gathered, over the time, an impressive collection of testimonies and sketches of the creature, made by eyewitnesses. According to his theory, this creature is the result of genetic experiments conducted at the base 731 of Pingfang, today’s northern China. Here, not far from the border with the USSR during the Second Sino-Japanese War (1937-1945), the Japanese Imperial Army conducted horrible human experiments, being responsible for the death of hundreds of thousands of people. This is the place the winged creature would have escaped from and subsequently it would have established its habitat in Primorye region, in the almost uninhabited taiga. The researcher explains that in the Pidan mountains of Sikhote-Alin mountain range lives an entire colony of such flying mutants and, most likely, they are the result of a terrible unnatural crossbreeding between two creatures from different species. But if the Russian scientist is right, how can one explain that records of a flying creature have been reported long before the start of the 1937 Sino-Japanese War and creation of 731 experimental center? Based on dozens of testimonies of hunters, geologists, tourists and even border guards, Vyacheslav Dvujilnîi has made a map of possible areas where these creatures dwell. Convinced that the winged beings have found shelter in Pidan mountains, the Russian cryptozoologist started an expedition, on their trials. It’s known that in the Pidan mountains there are several deep caves, interconnected in a vast network. That was professor Dvujilnîi’s destination, accompanied by several hunters, a biologist and a team of reporters from “Rossia” television in Moscow. The incursion through the dense coniferous forest lasted over five hours, the expedition arrived at the cave entrance when was already dark. “Without the guidance of Vladimir Eliciev, in charge of guarding the forest, we probably wouldn’t have ever found the entrance to the mountain’s underground. It’s so well hidden that even the forester, although he knows the area perfectly, circled a while, creating the impression that we got lost. The cave, totally unexplored, is extremely dangerous and unpredictable. Without an appropriate equipment and physical condition, you can’t reach its end. We went down into the depths over 30 meters”, says the teacher. After they crossed for kilometers underground, through rough areas, through galleries they crossed crawling on their bellies, the expedition has reached a more spacious room. There they found piles of bones, remains of animals that had been devoured. For some time they felt a strong presence around them, as if someone or something was watching them. Several members started to complain of severe headache and faintness. Then, Vyacheslav Dvujilnîi decided it was time to return to the surface. Suddenly, a squeal of an inhuman creature passed through the tunnel, and all the members of the expedition were petrified. The echo of the terrifying sound lasted for several seconds. They continued to rise, but the feeling that something was watching was still in their hearts. Crossing back the woods, they found traces of fresh blood among the leaves. A few meters away, they found the remains and the intestines of a ram. The biologist pointed out that no predator wouldn’t give away this “delicacy”. Every carnivore is eating the intestines filled with vegetable, rich in precious vitamins, then it drinks the blood to moisturize itself, then eats the water-rich organs and in the end, if still hungry, flesh and muscles. This seemingly unimportant retail demonstrated that this predator is not an ordinary carnivore of the known species that live the area, such as the Siberian tiger or the wolf. All these evidences, testimonies of people gathered along time, descriptions of researchers, conducted since a century ago, have led Vyacheslav Dvujilnîi to conclude that the winged man isn’t just a legend, but he really lives in the East Siberian taiga. Similar testimonies about a creature half man-half butterfly also exist in the United States Air Force archive, in the database of the department studying UFOs. Among the most studied reports were those eyewitness from Point Pleasant, West Virginia, dating from 1966-1967. On the evening of November 15, 1966, the couple Roger and Linda Scarberry were out for a drive, along with two friends, to Point Pleasant. Suddenly, they noticed in front of them, a few meters away, two red bright lights. 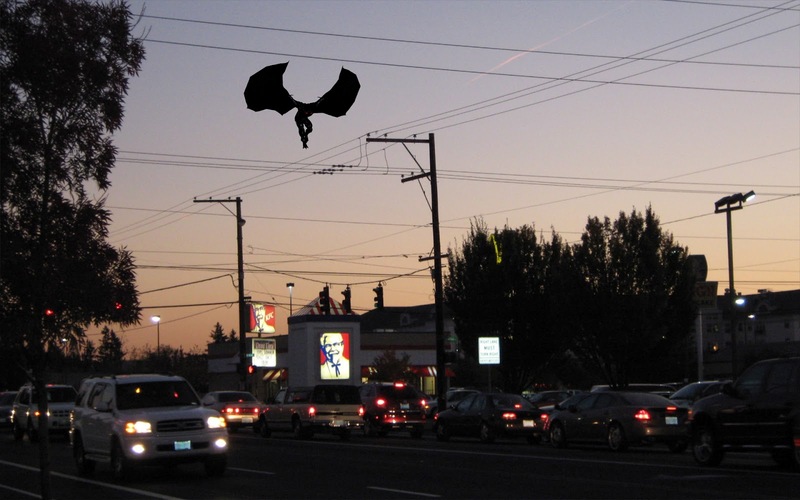 As they approached, they saw on the road a strange creature with human face and huge wings. Horrified, Olan Roger twisted the car’s steering wheel and accelerated in the opposite direction. The creature started pursuing them, with a moaning bawl. According to witnesses, was flying through the air at a speed slightly lower than that of the car, which was 160 km/h. No one knows what would have happened that night if the Scarberry’s car wouldn’t have been stopped by the police for exceeding the speed limit. The four terrified passengers told people about the strange creature and the tracking that had just taken place. The police investigated the area but found nothing suspicious. And maybe it would have been concluded that the four young people had a hallucination, if in the coming days at the police station hadn’t come several scared inhabitants of the little town, declaring similar occurrences. In the United States Army archives there are over a hundred of such testimonies. The phenomenon continued until December 1967, when a tragic event occurred in Point Pleasant: the nearby bridge collapsed, killing 46 people. After this accident, “Mothman”, as the flying creature was called, ceased to be seen by people. Thus, it was concluded that between the bridge collapse and the strange occurrences was a direct link. Locals believed that the winged creature can predict the future, being seen only prior to disasters. This also sustained Linda Scarberry, who witnessed several occurrences of the “Mothman”, after the night of November 15. “It doesn’t want to harm us. Just trying to communicate with us”. Is said that in West Virginia there are several paranormal areas, where unusual phenomena are happening. With almost two hundred years before the shadow of “Mothman” stretch over Point Pleasant, the plains around Ohio river were reddened by blood, a curse hovering over them. Here, at the middle of the eighteenth century, there were bloody battles between the Native Americans, especially the Shawnee Indians and settlers advancing towards the territory during the west expansion. The curse was thrown by Cornstalk, a leader of the Shawnee Indians, brutally murdered along with his son by the settlers. Just before his last breath, the indian cursed the lands around Point Pleasant village. There is a legend which says that his spirit is haunting these territories. In the ancient cultures of North American Indians, “butterfly of the night” or the moth represents a form of spirit or a soul trapped forever in the realms of death and that may, under certain conditions, to make their physical presence felt in the real plan. In the Indian folklore, moths are the children of the Moon which, in the darkness of the night, are looking for its source of light, endowed with magical powers of prediction, insight and knowledge of other worlds. They have the ability to move easily into the darkness, to metamorphose, and to hear messages from other dimensions. In this context, the assumption that “moth man” is an energetic entity, a form of spirit that can manifest itself in the material plan in order to send men warnings and messages has not been received with suspicion by paranormal researchers. Another hypothesis of the “Mothman” phenomenon is its extraterrestrial origin. Appearances of UFOs have often been reported both in the state of West Virginia and in the Primorye region of Russia. It was found that, most often, the appearance of Mothman anticipates the waves of unidentified flying objects. Electromagnetic disruptions in the cities and the messages telepathically transmitted to the people during their sleep have also been associated with Mothman and UFOs. Although these arguments seem to be sufficiently strong and the evidence more and more convincing, however, is hard to believe in the existence of these creatures. The mistery of mothman is still very deep and, most likely, will remain unsolved for a long time. Perhaps… forever. However, we shouldn’t ignore the fact that sometimes the answer is closer than we think.